Store-bought mold and mildew removers aren't good for your lungs or your pocketbook. Skip those toxic cleaners and make your own highly-effective tub and tile cleaner. Making your own bathroom cleaner is easy. While this spray works wonders on mold and mildew, it is also an excellent all-purpose cleaner. It can be used to clean many surfaces in your home but can damage some materials like marble. Always test a spot before using. If you like, add essential oils to create an aromatic cleaner. Combine the vinegar and water in a spray bottle and shake it to mix. Do not use straight vinegar as it is acidic and can eat away at grout. Another Cleaning Option: Soak a sponge in the vinegar/water solution, and wipe down any areas with mold or mildew growth. Note: This solution will kill the mold, but it won't remove the mold stains. Just add a little elbow grease to get rid of the stains. Vinegar really is the ultimate green cleaner. Distilled white vinegar is the most common and cheapest available and often contains 5% acetic acid. It is the high acidity that helps kill mold and mildew. It also inhibits future growth and can loosen rust and lime mineral deposits on your bathroom fixtures. At the same time, the vinegar cleaner will deodorize the bathroom. Are you worried about the smell of vinegar? Don't worry a bit! As soon as vinegar dries the smell goes away. That is why it is also a perfect fabric softener! It is inexpensive. A cup of vinegar costs less than $1 and a gallon can last for a month or two of regular cleaning. Look at how much you spend on each household cleaner and compare the costs. Vinegar will win every time! No harsh chemicals or fumes. 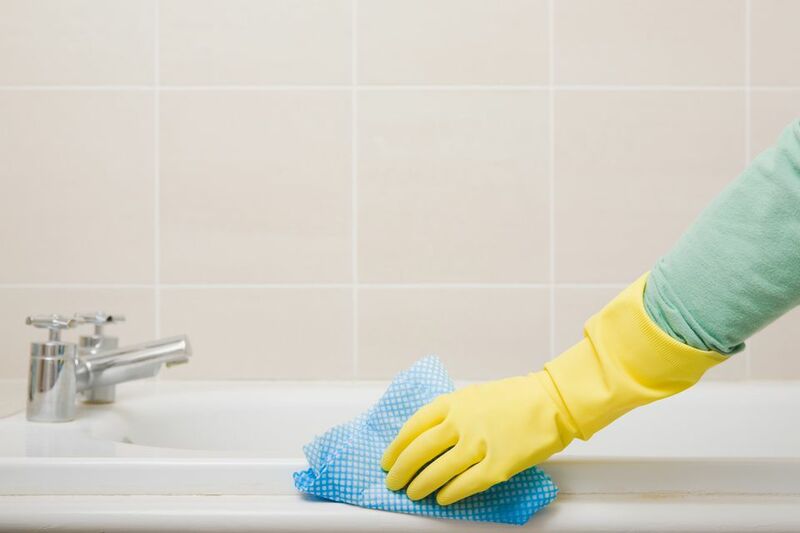 Cleaning the bathroom is not fun or easy and it is worse when you inhale toxic fumes. Even an exhaust fan and open window cannot bring relief and the odor lingers for hours. Vinegar may not smell the best at first, but that goes away quickly and you can breathe freely while you're cleaning! Natural mold and mildew remover and growth inhibitor. As mentioned, acetic acid kills mold that stops it from coming back. The real benefit is that it does so naturally so you can feel good that your family is living in a healthier environment. As with any cleaner, you should avoid all contact with the eyes and prolonged contact with the skin.